Due to an overload of commissions, Maggy has decided to discontinue the Summer Schools at Cobblestone Designs workshop. But people are still keen to learn! & so the following DVDï¿½s have been made & are offered as an alternative. 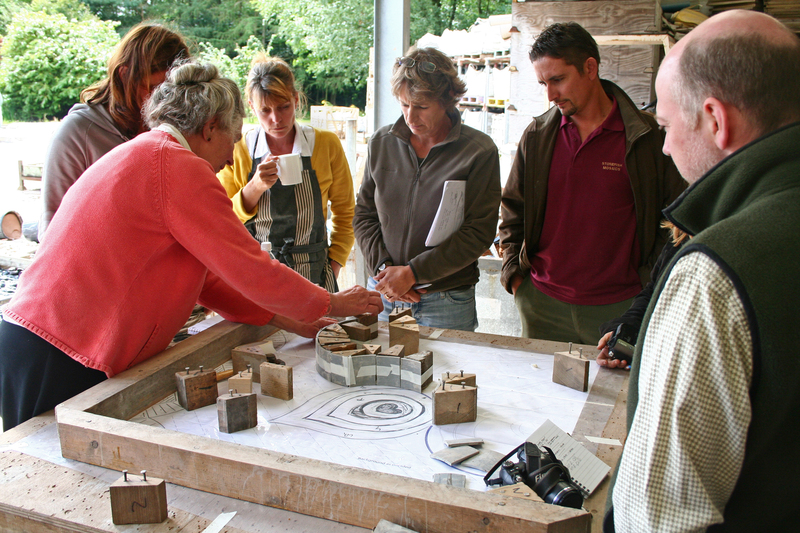 The ï¿½PRIMERï¿½ & ï¿½THE PRECAST TECHNIQUEï¿½ have detailed demonstrations & in-depth advice on all aspects of making pebble mosaic, whilst the ï¿½PICTURE SHOWï¿½ represents several of Maggyï¿½s lectures, giving inspiration & ideas. See HOW TO ORDER at the foot of this page..
& points out the little details to master, which make the work special. Price £30, including postage; only available direct! 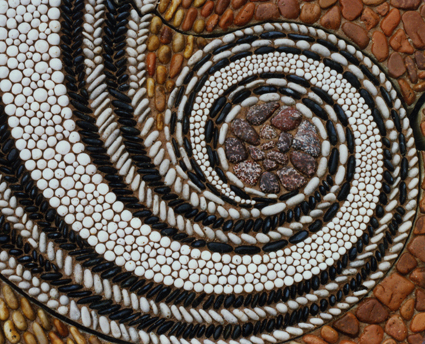 The ï¿½upside-downï¿½ method pioneered by Maggy Howarth for making pebble mosaic in moulds, which are then cast into the form of slabs with grout & concrete. Not for beginners! but here it is: the method used daily at Cobblestone Designs studio is explained in detail. The DVD covers the same ground & more as at the Advanced Precast Course at the Summer Schools. 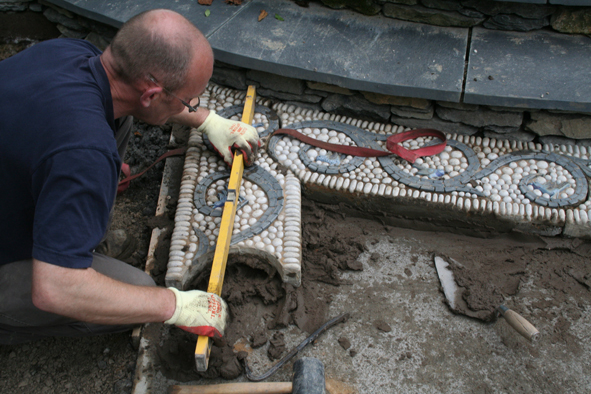 This method is the long-term solution for areas with freezing winter temperatures, for portability, & for achieving fine detail in the mosaics. Price £35, including postage; only available direct! An inspirational "slideshow" of pebble mosaics throughout the world, with unique photographs from Maggy's library, & her detailed commentary. The history of the Mediterranean tradition, from Spain, Italy, Portugal, Greece & the UK, also the separate world of Chinese pebble mosaics. Bringing the survey up to date, the DVD includes the fascinating & varied work being made made by leading contemporary artists. This DVD is of general interest to garden designers & landscape architects as well as being an eye-opener for students of pebble mosaic. PRICE £20 including postage, only available direct! For the U.K. please send a cheque to the adddress below. IMPORTANT! - 2 formats are available. For the U.K. & Europe you need PAL; for the U.S. &Canada you need NTSC. Please check & state which you need.